A deposit of £100.00 non refundable, will be required to secure your booking with the balance payable 30 days prior to arrival. An additional refundable security deposit of £100.00 will be added to the total, this is refunded at the end of your stay subject to cleaners inspection. 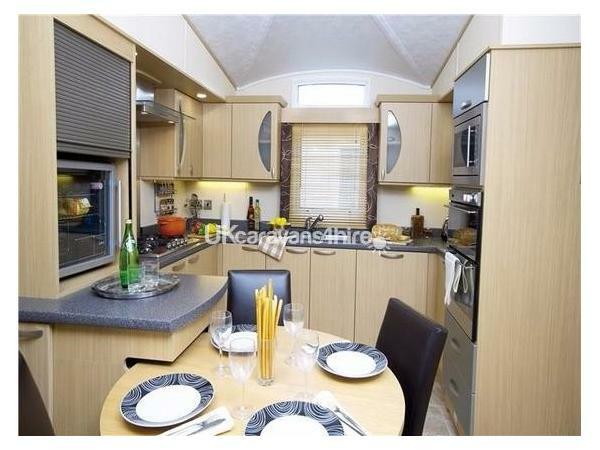 My ABI St. James is a luxurious top of the range 2 bedroom caravan sited on Woodlands , a premier pitch with stunning views over Fleet lagoon and surrounding countryside. It is double glazed and fully central heated. Double patio door open up on to decking with table and chairs perfect for sitting out in the sunshine or to enjoy a nice glass of wine in the evening. In the large lounge there is a very comfortable freestanding 3 piece suite consisting of a sofa incorporating a double bed , and 2 swivel armchairs, a modern flame effect fire on the wall, a 40" Sony flat screen tv and Sony DVD player. The kitchen is fully fitted with eye level oven integrated grill and microwave, 5 ring gas hob, fridge/freezer , chilled drinks cabinet , washer /dryer and dishwasher, dining table & chairs. The 2nd bedroom has twin beds that can be pushed together to make a double if required, a dressing table and stool , wardrobe unit with drawers. Travel cot available on request. 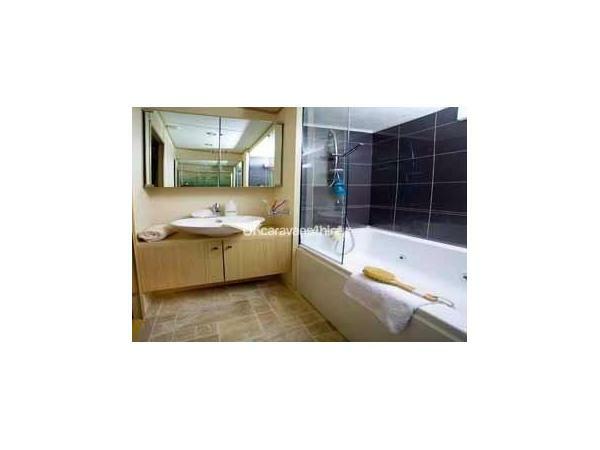 The luxurious main bathroom contains the superb Jacuzzi bath, shower, WC, basin with vanity and mirrored storage and a heated towel rail. Main entrance leading to the kitchen also has gated decking . Duvets and pillows provided so all you need bring is bed linen and towels. This is the best caravan I have ever stayed in. The view was amazing. Best bed ever, so so comfy. Lynn was a pleasure to deal with. Thank you Lynn. I will definitely be back. 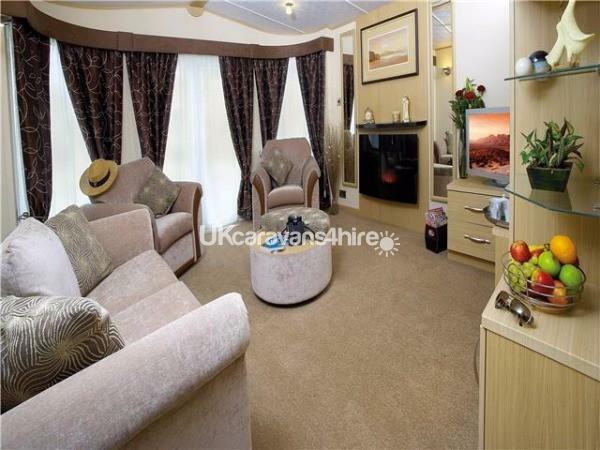 This is a very spacious caravan with everything you need and in a prime position. It was very comfortable. There is a beautiful view of the bay. The company of eight badgers in the evening. It was very quiet and we got the rest we needed. Thank you Lynn we loved it and hope to be back one day. Can highly recommend it. 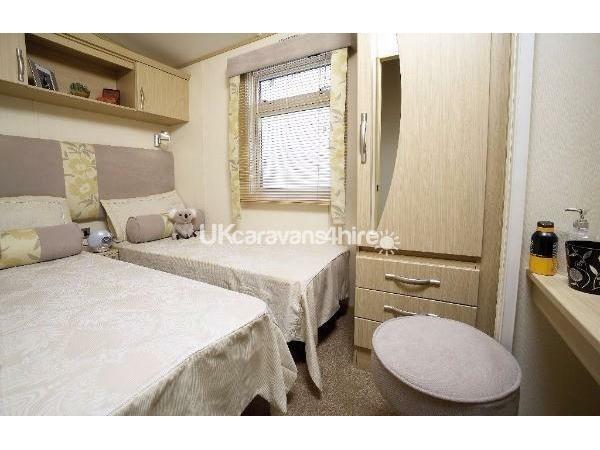 Gorgeous caravan, very spacious especially in the double bedroom. The double bed was extremely comfortable, not at all like other caravans we've stayed in. Lynn was very helpful especially as we rang on Good Friday asking to book the following Wednesday. Fantastic view of the lagoon, and very comfortable chairs on the decking. We enjoyed a glass of wine every night outside and were in a prime location to watch the beautiful sunset. The decking is fully enclosed if you have younger children. 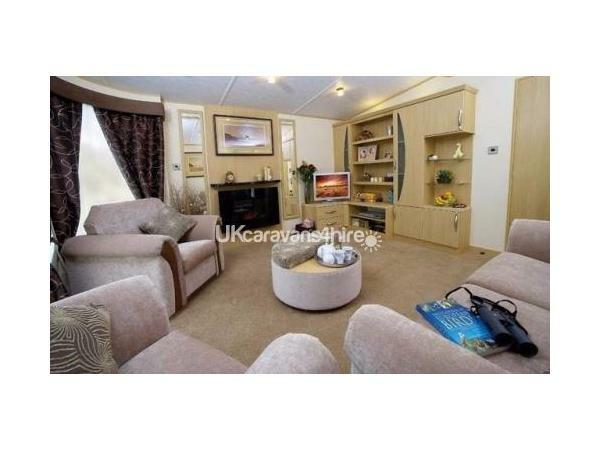 The caravan has proper sofa's to relax in, which was one of the reasons we chose this caravan. They were really comfortable. The kitchen has everything you'd need and more including a washing machine and wine cooler which can hold a lot of bottles. At this location of the park we saw badgers every night, a highlight of the stay for our two boys aged 10 and 8. Totally recommend this caravan and location, lots to see and do and the site is very safe for children. Thank you very much for the great review , I am so pleased you enjoyed your stay. 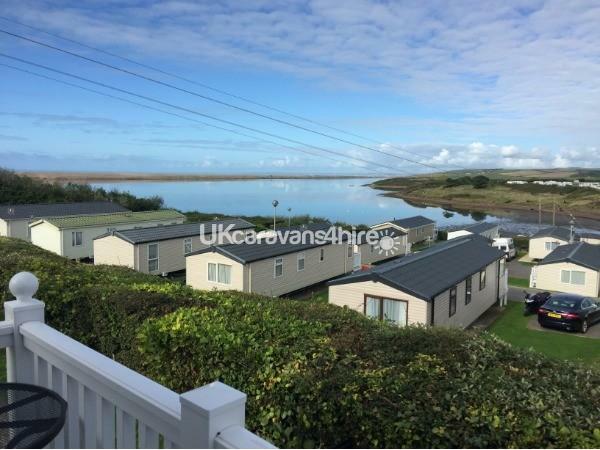 Best caravan we have stayed in, fantastic views over Lagoon, Lynn the owner was great making sure everything was in place. Littlesea is great for young and old swimming pools are great lovely loungers outside. Kingsize bed was soooo comfy best sleep ever. 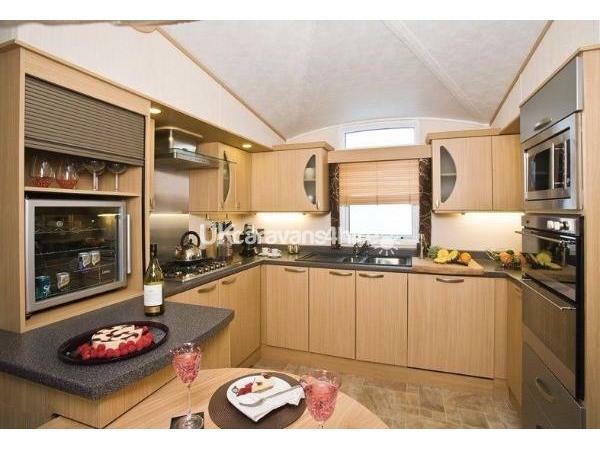 This is a beautiful caravan in a stunning position on site, overlooking the sea. The caravan has plenty of room for our family of 4, including space for all the toys the 2 young ones have to travel with! We also found the caravan to be spotless on arrival. We also found the room sizes for all family members to be perfect. The caravan has parking right next to the van with decking leading to the door, which is also gated - great for keeping the kids safe. 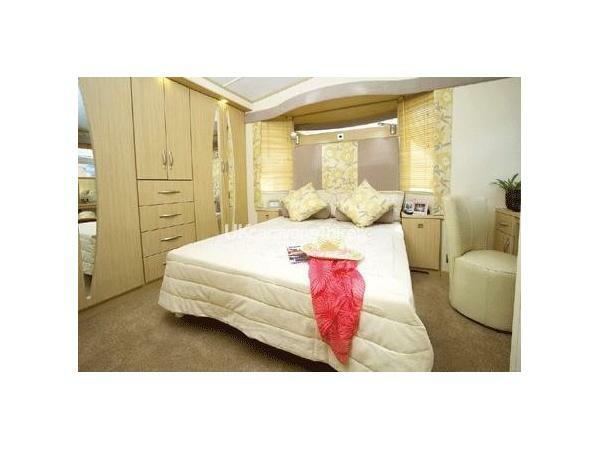 The caravan also has a separate decking area on the front, which can be accessed by patio doors. This decking area is totally enclosed which is not only fantastic for letting the children play on without having the worry of them getting out but also a beautiful place to sit and have something to eat and drink, especially at night watching the sunsets over the sea. We can honestly say, the only thing we found missing from the caravan was its own Wifi facility. This would be useful as being so close to the beech, mobile network was sometimes hard to come by. The caravan is only a short walk to all the parks facilities, including the indoor and outdoor pool, arcade, pub and takeaway places. It is also close to reception and Starbucks!! We also found the parks shop, Spar, very reasonably priced and well stocked. We found the owner of the caravan to very helpful, with booking and all correspondence happening promptly and seamlessly - with a lovely little welcome package for us on arrival. Following check out, the owner contacted us to ask if we had enjoyed our stay and was very prompt in returning our deposit. 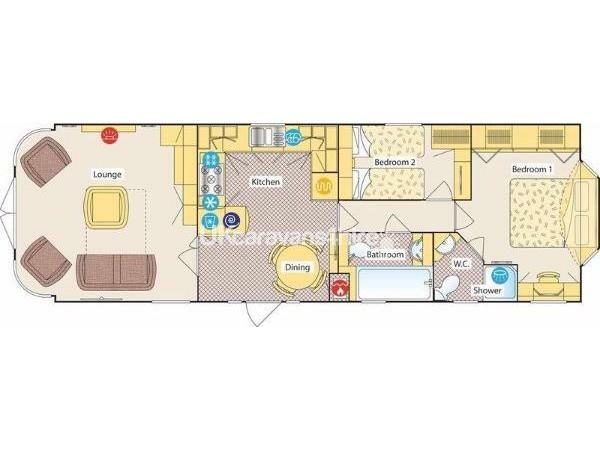 The whole family had a fantastic holiday and we will certainly look at booking this caravan with the same owner again, we would highly recommend.